Energy Requirements From the earth's interior heat. Tectonic forces are used to deform the crust. -------BOUNDARY ------ By definition the boundary between the aesthenosphere. and lithosphere is where there is NO brittle character left to the rocks. Rocks are all ductile until we get down to the Mesosphere. A joint is a fracture in a rock that shows no movement. 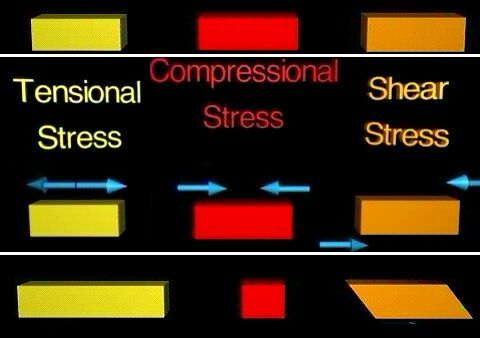 A fault is a fracture which shows movement. When the underlying rock is no longer in a horizontal pattern, it can still be mapped. The two defined directions are called dip and strike. 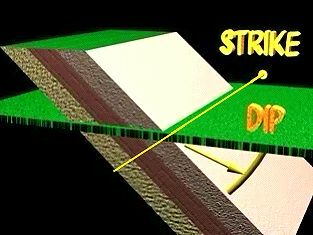 The strike is the direction which the inclined sediment crosses ground level. It can sometimes be determined by mapping many rock out croppings and then aligning them until the direction can be ascertained. The dip is the angle of incline of the raised beds into the earth. It is measured from the horizontal down to the dipping plane. 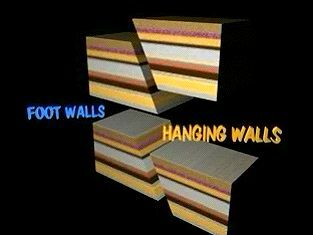 The hanging wall is the wall that is located above the fault line. The lower block is called the footwall. It makes no difference which way the rocks move only their relative location. Oblique fault: like the movie - two directions.